You can use an existing email marketing campaign as the foundation for a new campaign. On the Campaigns page, click Compose! 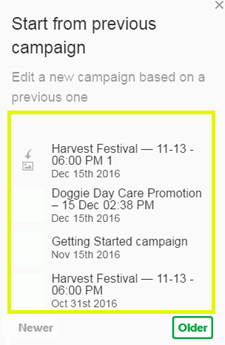 In the right pane, under Start from previous campaign, click one of the existing campaigns listed in the pane. Rename the copied version when the Composer opens. This helps to avoid confusion between the original and the copy. If you don't rename the copy, Email Marketing will add a number to the end of the copy's title.